The Rockwell Group and NYC Parks unveiled their plans last week to turn a 1.5-acre section of Betsy Head Park in Brownsville into a lush and active playground. When designing Imagination Playground, the firm looked to treehouses for inspiration. The site will feature a winding ramp that snakes around London Plane trees and connects to slides and a series of jungle gyms that spill out into an open area with sand, water, benches, and plantings. In collaboration with landscape architecture firm MKW + Associates, the Rockwell Group has taken on this project pro-bono and will donate a set of Playground Blocks to the Brownsville Recreation Center. The $3.92 million playground was funded with the help of government subsidies from Mayor Bloomberg, Borough President Markowitz, and Council Member Mealy. 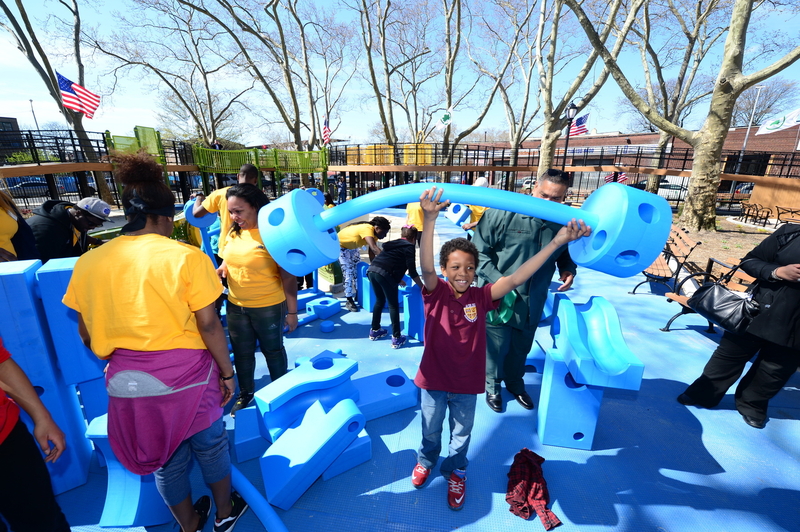 Partner David Rockwell founded Imagination Playground in partnership with NYC Parks and KaBOOM, a non-profit organization, to encourage activity and unstructured play for children at nominal cost by providing loose building blocks in outdoor recreational spaces. Right now the project is slated to break ground in spring of 2014 and open in 2015. “It doesn’t seem like it, but everything connects with each one perfectly,” said Gabrielle Sunderland, 12, squinting happily toward the hot July sun. Around her were piles of weather- and germ-resistant foam blocks in sundry shapes and sizes. 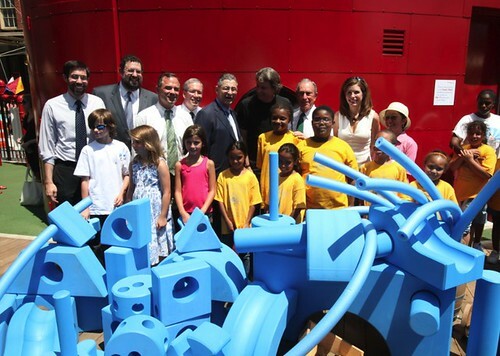 The blue pieces are the signature element of David Rockwell’s Imagination Playground, which opened Tuesday on Burling Slip near the South Street Seaport. A designer of theaters, high-end restaurants, and Broadway stage sets, Rockwell found his own children bored by the playgrounds of Lower Manhattan. So he set out to create a playspace where kids could use their own imagination, just as he once did. “Playgrounds are the places where kids can learn how to be a community and create their own worlds, but the ones we visited were all too linear,” he told AN at the opening. “That gave me the idea of a different kind of playground.” Gabrielle and her friend Ajda Celebi, 10, were industriously showing off Rockwell’s central strategy: providing kids with loose pieces that promote unstructured play. The girls set two rectangular blocks together with a noodle on the side and a ball on top, creating something like a giant teapot. They liked the fact that the playground allows them to make structures entirely “out of your own creativity,” as Ajda put it. The project got its start after Rockwell persuaded Parks Commissioner Adrian Benepe with a drawing on a lunch napkin, and then spent five years researching progressive learning theory and child development. He also helped round up funds for the $7.5 million project, which included a $4.5 million grant from the Lower Manhattan Development Corporation and $3 million from the New York City Department of Environmental Protection for the relocation of two water mains and a sewer line into the adjacent street. Rockwell also teamed with nonprofit playground designer KaBOOM! and together they developed Imagination Playground in smaller portable versions, tested and tweaked after trial tours in Washington, D.C., New Orleans, Miami, and New York. But the first permanent site for the concept is designed pro-bono on a former parking lot at Burling Slip. Comprised of a large multi-level deck in the shape of a swooping figure eight of reclaimed Indonesian teak, the new playground is essentially an empty space for the array of 350 props. Situated in a landmark district, the landscape does include some features that recall the surrounding area’s nautical past, including reused benches from Coney Island, barrels, and burlap bags. The west end is the sand pit, consisting of sloping wooden ramps and four wooden masts made by a shipbuilder, each connected by ropes and pulleys. In the center stands a crow’s nest atop a red, circular structure housing bathrooms and a storage space for the blocks. At the east end, a rounded amphitheater for storytelling overlooks an ankle-deep pool with pipes and canals that enable the control of cascading water. A staff of city workers trained as “play associates” oversees the action, as with all Imagination Playgrounds. According to Benepe, Burling Slip is the start of a new era of New York City playgrounds, where Rockwell’s sponges will replace worn-out monkey bars, swings, and jungle gyms. “The next step is to look at playgrounds that are underperforming and need renovation in central Brooklyn and the South Bronx, and apply the concept,” he told AN, adding that these might come with a different set of materials. 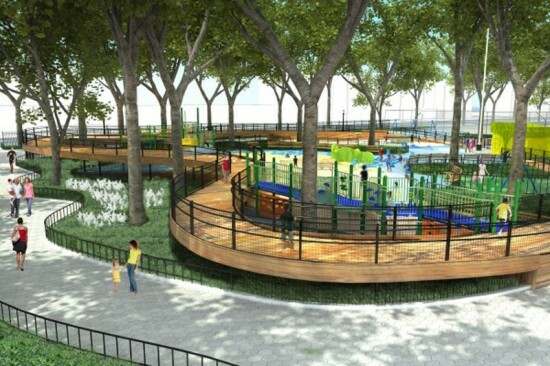 “Here we had a flexible budget, but we could take a traditional Parks Department playground budget, and use these approaches.” For his part, Mayor Michael R. Bloomberg described the project as a tremendous success. “It is always amazing to see what children choose to create when they are fully using their imagination,” he declared. As for the little pirates, they too gave the playspace top grade. “It’s all big and blue and bendy,” Gabrielle said, while balancing a cog on top of a cube tower. “It’s a lot of fun!” And Ajda added, “The new West Thames playground where I live is really cool, but this one is more fun, because you can do anything here.” With that, she eagerly returned to helping the other kids dam a cascading water flow in the pool area. To everyone’s joy, the jets of water created unexpected rainbows against the blue afternoon sky. For the past few years, David Rockwell, that master of stage and scene, has been developing the Imagination Playground, a deployable playground-in-a-box that has been finding its way across the country. Now, he is just finishing a larger playground, sort of a showcase for the concept, at Burling Slip in Lower Manhattan. (As the rendering after the jump shows, it's quite literally a flagship.) To celebrate the opening of the new playground at the end of July, the Parks Department is taking imagination playgrounds on a pop-up tour, which kicked off this past weekend in Staten Island, with stops in all five boroughs to follow. It truly is a revolutionary concept in recreation, though not the first, as we've chronicled. In the current issue of New York, Justin Davidson even gives us the best 19 in the city, yet another mind of the parks renaissance currently taking place in New York.